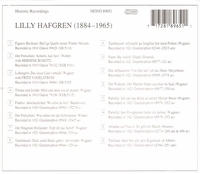 "Lily Johanna Maria Hafgren was born in Stockholm, and came from a musical family who were engaged as performers and/or composers. Her initial training was in piano, and during a concert tour in 1907, she performed while singing at a home where Siegfried Wagner was present, and he encouraged her to pursue a career in voice instead. Invited to Bayreuth, she passed the audition and made her début as Freia in Das Rheingold. The director of the Mannheim Opera, Carl Hagemann, was present and hired her on the spot. Over the next four years she gained experience with almost all of the youthful, romantic roles."